Fillion, as the fairer-haired brother, took on the role of Jon Baker, opposite his brother’s turn as Frank “Ponch” Poncherello. “We’d be on our bikes with walkie-talkies that were terrible and never worked,” Fillion recalls with the smirk of a man with hindsight. These days, Fillion, now 47, has graduated to playing a rookie police officer. 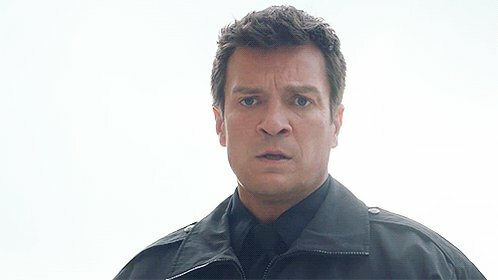 Two years after wrapping his stint on ABC’s popular whodunit procedural “Castle,” Fillion returns to the network in the new cop drama “The Rookie.” Based on a true story, the series follows John Nolan (Fillion), a 40-year-old, recently divorced small-town guy who, after a life-changing incident, decides to leave his comfortable life to pursue a career as a cop — becoming the oldest rookie officer in Los Angeles Police Department history. The series premieres Oct. 16. Inside a spacious trailer on the Warner Bros. lot in Burbank, Fillion, who also serves as an executive producer on the series, has plopped down in a chair during an afternoon break from filming the fifth episode of the season. He’s as genial and self-deprecating as you’d expect from a guy whose earned the reputation as the charming guy-next-door. He also has that slightly tired-but-resilient look of a person settling back into the grind of a network hour-long drama. Specifically, this idea of hitting the reset button later in life felt to Fillion like intriguing ground to cover. Fillion knows something about changing course. He was raised by two English teachers, and like his brother, was on the path to become an educator. It used to be that you get a job and that’s your job until you retire. Things move much faster now…You have to change with it or you get left behind. Needless to say, he’s never been Mr. Fillion in a classroom setting. His Edmonton theater work led to a role on the soap opera, “One Life to Live,” in 1994. Of course, he could certainly teach a course in the art of building a career as a reliable prime-time television star who also has rock star-like status at Comic-Con with an impressive résumé of cult-following projects (Joss Whedon’s “Firefly,” “Dr. Horrible’s Sing-Along Blog” or James Gunn’s “Super”). As Fillion tells it, he’s “super-duper lucky” to have portrayed a lot of characters that appeal to him. To maintain his grip on the heroic guy-next-door persona this time around requires a finesse with action sequences. The stunt work — however much of it he chooses to do — has already prompted Fillion to come up with his go-to zinger about doing action scenes at this stage in his life. So, if ever he experienced his own life-altering event, what would be his do-over?